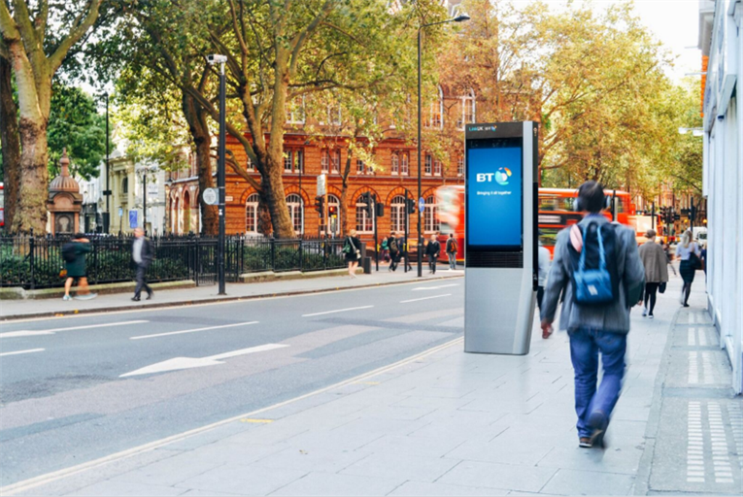 Primesight has won the outdoor contract for BT's phone boxes from JCDecaux in a deal that will mean consumers get free wi-fi and calls from upgraded phone kiosks. Primesight has teamed up with Intersection, the digital company backed by Google owner Alphabet, that already manages a similar scheme in New York City, called LinkNYC, where outdoor ads fund the cost of free wi-fi and calls for consumers. The BT scheme will be called LinkUK and is a joint venture between Primesight and Intersection. It will launch in London with a view to being rolled out in other UK cities. Primesight did not reveal the value of the long-term deal. Industry observers suggested the current contract is worth in the region of £10m-£15m a year and Primesight could generate as much as four times that amount once it has installed at least 750 of the digital kiosks over the next few years. The "sleek, ultramodern kiosks", called Links, will be only about a third of the size of existing phone boxes and feature two 55-inch digital advertising screens – one on each side of the kiosk. Naren Patel, chief executive of Primesight, said: "It’s a beautifully designed product. We’ll be selling it with a high degree of flexibility. It won’t be ‘buy for two weeks’ or nothing." The roll-out to "major high streets" in London will start in Camden late next year. "Hundreds of users within range of a Link will be able to access free ultrafast Wi-Fi on the move, with speeds of up to 1Gbps – the fastest free public Wi-Fi service available," BT said. Consumers will also be able to charge their devices, access maps on a built-in tablet screen in the kiosk, and look up other local services online – at no cost to users or taxpayers. "The dream is that when you’re around central London, you’ll always have high-speed wi-fi," Patel said. "I was in New York four weeks ago and looking at the [LinkNYC] units and I was downloading movies in 60 seconds." The cost of each kiosk was undisclosed but it is thought to be upwards of £30,000. The local council in each area will need to give planning consent to the changes. Patel said he does not see the Links as a threat to JCDecaux’s bus-shelter roll-out for Transport for London. "We think it will be complimentary, not a threat," he said. Traditional red phone boxes will be unaffected by the Links as they are listed under heritage rules. BT has nearly 17,500 phone boxes and the majority will not be converted to Links at this stage. "They are still very good advertising units," Patel pointed out. Primesight will sell outdoor ads across the BT phone box estate as part of the contract. Rajesh Agrawal, deputy London mayor for business, welcomed the LinkUK move. "London is already widely regarded as one of the technological capitals of the world but the mayor is determined to improve connectivity across the city to ensure we maintain that position," he said. BT said the Links will have feature sensors that could also capture real-time information such as air and noise pollution and traffic conditions.